I love wolves. My money helped the project that got them reintroduced to Yellowstone way back when. It was one of the first causes I supported after getting a degree in engineering. That was long before the dolphins showed up and took over my life – in a good way! Makes sense though. Wolves are much like orcas on land. I’ve seen this video going around, but just didn’t pay attention. It crossed my path again today and I stopped to notice. It is well worth your time. When I watch this film, well, it makes me cry. The positive difference one species can make to the whole is extraordinary. We are “supposed” to be that species on this planet. However, unlike a wolf pack that works very very well together, humans don’t do that so well. LOL. This one wants to exploit and destroy the earth for profit This one wants to save the earth at all costs. We are the custodians of this earth. Time we started taking that role more seriously. As I made the commute to work this morning – walking down the hall, through the kitchen, down the stairs to my office – after I passed the kitchen window, I realized I had just seen/felt something out in the yard. A lovely doe was chomping on the clover. Ah how I love deer energy and what a wonderful way to start the day! King of the Forest, the protector of its creatures. For time immemorial people have sought to identify with the stag by ceremonially wearing antlered headdresses and imitating the deer’s leaping grace. Both Celtic and Native American hunters prayed to the deer to give them a good hunt, and in return promised to take no more than was essential for the survival of the tribe. This helps remind us that our spirit of gentleness and unconditional love should extend to all species, not only our own. Maybe the most effective way to summarize the lessons of these beliefs, is to say that only when we move through life in the spirit of love for all beings can we melt the barriers that separate us from others, from other life forms, and from the beautiful mystery which is our own magical and spiritual gift. By observing the ways in which deer behave, it is possible to see what amazing qualities – or powers – they possess. From the deer we can learn that the gift of gentleness and caring can help us overcome and put aside many testing situations. Only love, both for ourselves and for others, helps us understand the true meaning of wholeness. If a deer crosses your path, this may show you that you are a very compassionate, gentle and loving person. If you don’t have these qualities, then consider if you have a problem that needs addressing. Are you facing a challenge in your life, whether with a fellow human being or a delicate situation? If you are feeling negative emotions such as anger, try letting go. Think about whether a gentler and more loving approach can sort the issue out. It may be necessary to speak the truth, this is best done with kindness and from the heart, this will generally give a better result. Deer teaches us how powerful it is to be of gentle demeanour, to exert keen observation and sensitivity. Deer’s are in tune with nature and all it comprises. They are sacred carriers of peace and show those with this power animal how to open their hearts and love unconditionally. Frequently twins or even triplets are born in the spring. Females and males reside in separate groups until the mating season. White-tailed deer are rather sociable, and family members forage food together along with other family groups, which gives the appearance of a large herd. Fawns are born a colour that protects them, camouflaging them from a predator’s sight. In the first few days of their life they hardly move, until their energy field is strong and grounded. They then stand up and begin to follow their mother around. A magical sight to behold is fawns coming out of forests, following their tenderly protective mothers. Even when grazing, the mothers are constantly watchful, fully aware and alert of what is going on all around them. They travel through forest and field with deliberateness and clarity, mindful of the fragile creature they nurture and protect. There is a powerful lesson to be learned here by us. Though we are born with an inborn ability to be unconditionally loving, often we are born to parents whose life experiences have taught them to become hard, and to lose that ability to experience and give unconditional love. Watching the deer and her babies is a reminder to honour and respect the child-like innocence within your self and go about your life with gentleness and an open heart. You should also stand strong on your path, in your beliefs, and not allow yourself to get distracted by outside influences. A deer’s senses are very acute and they see extremely well in low light, giving them the ability to understand the deeper symbolic meanings of things. They can hear a twig snap a very long way off. People with this power animal are often described as being swift and alert. They are intuitive, often seeming to possess well developed, even extrasensory perceptions. Sometimes their thoughts seem to race ahead, and they appear not to be listening, to be somewhere else. Anyone with power animal has latent clairvoyant and clairaudient abilities. They can see between the shadows, detect subtle movements and hear that which is not being uttered. Ask the deer to help you develop these true gifts. The set of antlers grown by the male deer are antennae that connect it to higher energies. If you come across a deer in the wild, try to count the number of points on their antlers. This number is associated with numerology and can carry great significance for those with this power animal. Deer teaches us to be gentle, to touch the hearts and minds of wounded beings who are in our lives. 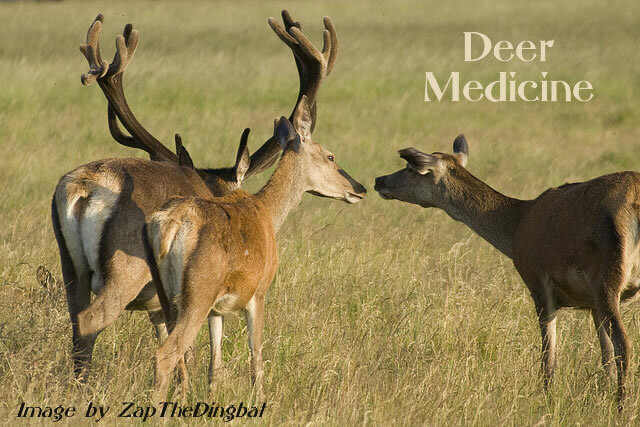 Don’t push people to change, rather gently nudge them in right direction, with the love that comes from deer. Love and accept people as they are. The balance of true power lays in love and compassion. Ina Woolcott ~ passionate about the Earth, about our Children and about creating a better world. Visit http://www.shamanicjourney.com to read more articles like this. It has been said that the next few weeks are the reason you have chosen to be born upon planet earth at this time. The Mayan time keepers and other indigenous cultures have indicated a shifting of the ages, an ending of the old and an ushering in of the new, the ending of the Piscean age – begun at the time of Christ – and the start of the Aquarian Age – sung about in the 60’s. Zero Point, a shift of axes, a reversal of polarities, etc. have all been discussed. It is the end of the Mayan long count ( 5,125 year) cycle. It is also the conclusion of the Precession of Equinoxes (26,000 year) cycle. I love triple numbers and 12/12/12 is right around the corner. On December 21st, 2012 we experience winter solstice and the “ending” of the Mayan calendar as it has existed for the past several thousand years. It will be a new day. In the Mayan system, there are 20 suns (aspects of God) and 13 galactic tones (numbers). When a person turns 52, they have experienced every possible combination of energies and are, therefore, an elder. I am very excited to be celebrating that milestone at my next birthday this coming Spring Equinox 2013. I used to teach a class on the Mayan Calendar, your Mayan birthday, and how working with those energies can benefit you. It has been a great honor over the years to facilitate the 52nd birthday ceremony for several famous spiritual teachers and oracles who specifically requested that I be the one to do that. Whether the shift will actually be as big as the all the hoopla seems to indicate, is yet to be determined. However, I will say this: the personal shifts I have experienced have been so tangible and significant of late that it would be impossible to ignore that something profound is definitely underway. I have received instructions (through direct revelation) to spend time daily in meditation, in nature, in silence, ever mindful of the present moment. I find myself exercising more, taking longer daily walks in nature, and not eating until well into the afternoon most days. It would be wise to not get caught up in conversation or thoughts that take you out of your heart and internal knowing. Stay firmly centered and balanced focused ever on your connection with The One (the Divine by whatever name you prefer). Many unexpected changes seem to be landing in people’s laps. Navigate them with wisdom Dear Ones. Ride the wave, rising above the mayhem and chaos, not allowing fear to take hold in your consciousness. It is so easy to forget that you are a child of God, a hu-man (God-man / God-woman) living a human experience. The bigger part of you, the eternal part of you, is unaffected by human experience and emotion. It cannot be sick, age, or die. It is here experiencing an acceleration in evolution. Every moment of your daily life is the classroom in which you learn and grow. For those on a conscious spiritual quest, often a moment occurs – some would term it an initiation – in which a radical shift in consciousness happens all at once. I was recently having a discussion with a friend about this phenomena and they talked about a “walk in” experience. A walk-in is a being that literally walks into an existing experience of another. Instead of being born as a new born human child, they wait until the person is grown and then step into that person’s body and experience. It sounds scary, or even somewhat like possession. It is not. That is something else entirely. A walk-in is a prearranged event and both parties are fully aware that it is to occur. It is an agreement made prior to incarnation and there is often communication between the parties all along during the life of the human that is going to walk out so the other being can walk-in. The instances I have heard of where this happens are actually extremely high level beings here on a very big planetary mission. “You mentioned the walk-in phenomena. I’ve had that type of “feeling” a few times. But a more accurate description for me personally is an integration of “yet another aspect of self.” Some of my aspects seem to make a much bigger impact on the whole than others. But instead of “me” moving out and another “something” moving in to this vessel, it feels more like a giant addition was built on to the mansion. I’ve never used that exact analogy before. I tend to talk more about it being another facet of the diamond has lit up. And when we speak of bigger aspects, perhaps it is whole sections or sides of the diamond that suddenly turned on. If you have been feeling strange of late, perhaps it is because a higher aspect of you has become more a part of your day to day experience. This time in our planet’s history makes this infinitely easier to experience. Whenever this happens, there is a period of integration that must occur. It requires that you spend more time alone, sleep more often, engage less with others, particularly large noisy groups. I call it cocooning. You need to go off into a safe space and integrate for awhile. As the higher aspect integrates, there is a reweaving of the light filaments and the energy field. The nervous system has to handle higher frequencies. I always feel like my nerves are on fire and emotionally vulnerable during this time. And I always feel much better if I just stay home and rest for a few days and adding extra minerals to my diet. I often drink 2 or 3 Xooma drinks a day instead of just one. Some integrations only take a few days. Others have taken a few months. The more in tune you are with higher wisdom, the easier it is to know what to do in these moments of integration. Following the steps in the 7 Secrets to Dancing Through Life EmPOWERed, EnRICHed, and EnJOY! to stay in balance and rise in consciousness with ease and grace. The ebook is a free gift when you subscribe to this newsletter. DeLightful to hear from you. “Readings” and “healing” are definitely not the same. The Seed of Divine Restoration offers profound energies for a complete life transformation. I consider most “readings” mindless entertainment and some are even potentially harmful. However, if you are facing a serious issue that you have tried everything in the world to fix with no result, sometimes in a private session with a gifted healer, a past life regression is called for. In that case, understanding the memory (or metaphor) of the experience can often shed light on the current issue and allow it be healed more easily. Readings address none of this. A reading is typically done by a person with some psychic skill reading into the psychic realm as it relates to you. The reading is often tainted by the beliefs, fears, judgments, and expectations of the “reader.” A reader’s level of consciousness and awareness greatly influences what they can and cannot read about another. And, if they are having an “off” day – meaning they are upset or out of balance in some way – it will definitely affect their ability to “read.” The same is true of healer’s abilities as well. Those who can get out of the way completely, and let higher wisdom come through, are truly a gift to humanity. Don’t get me wrong . . . there are definitely individuals who are truly gifted, clear, and at a high level of consciousness and awareness. A reading with a person like that can have profound beneficial influence on your life. Sadly, not everyone is “reading” from that place. Also, any “reading” that relates to what is happening with you right now is subject to change if even one new decision is made or new event happens in your life. So as soon as the reading is finished, its already quickly becoming obsolete. I mentioned that they can be dangerous. The human mind is a very powerful thing. If a reader tells you that something “negative” is going to happen, even if that isn’t the truth, your worry about the thing can indeed cause it to happen. Because a reader is able to get information that you can not, it is human nature to believe them and give their words more value – even if what they said was not the truth. Even if you consciously discard the words thinking they don’t sound right or “feel” right, your subconscious mind has already heard them. It is for that reason that I avoid readings – and always have. On very rare occasion, if I am specifically Divinely guided to do so, I will have a reading done. I have had maybe 3 to 5 my entire life. And truthfully, I barely remember them at the moment. Typically its one word or one concept that I needed to hear and that’s it. That is not what the “Seed” is all about. The Seed of Divine Restoration is one of my spiritual gifts. It was revealed to me “directly” while on a vision quest high in the mountains of New Mexico. I did not learn it from someone else. Nor can I teach it to another. Question: I was wondering about vibrational energy. Specifically about everything having its own vibration. We are all unique in the Universe. Just as our thumb print is unique, the very specific vibration we have is also unique. Different species have their own unique vibration (tone). Within each species, each individual has a unique vibration that falls within the range of that particular species overall tone. Question: I believe that if someone truly wants to heal themselves that that can. I believe in miracles and I have seen them happen. Its a tricky area however. What a person believes, or what they say they believe, is coming from their conscious mind – which science has now proven is less than 20% of the mind and therefore less than 20% of what matters. When we read something and think about it and then say, “Yes, I believe that,” we are doing that with our conscious mind. We have not taken into account the subconscious mind which has fears, beliefs, judgments, and expectations that our conscious mind is not even aware of. Some of those fears and false beliefs are passed down from our ancestors through DNA. Some we pick up as small children as we experience this new world we find ourselves in. Others actually come from previous incarnations. So, saying “I believe this” is not actually true in most cases. We may have embraced it with our conscious mind, but the subconscious mind may believe something else entirely. That is where the real work is – addressing those hidden “truths” about who we are and what we truly believe – deep down in the shadows of our subconscious mind. That is much of what I help people address. If we truly believed and understood who we are in relation to being human and in relation to our Divine heritage, then we would not be sick, we would not die, we would not experience poverty or disharmonious relationships or any of the nonsense we all experience here. Our only limitations are our beliefs. Sin is “wrong thinking” and that is what we are learning here in the classroom called earth. It is a rare individual that can believe on all levels that they can heal themselves. I have done it. But I was not “healing myself.” I had been Divinely inspired to visualize golden orbs of light and to place them on a particular part of my body. And I in no way felt “I” was healing myself. I felt I had the help of the entire Universe. Jesus made a statement about “Where 2 or more are gathered.” Most miracles seem to happen when a person has asked for help from another, they believe the person truly can help them, and the person they have asked trusts their Divine inspiration (intuitive hunches) when it comes to healing. Most of the healing I have seen and heard about has happened in this way. Question: Most people feel the need to look outside of themselves. If you consider the consciousness of most people on this planet, few have reached 500 on the consciousness scale. We have determined that until a person reaches at least about 450 on the consciousness scale, they really do need outside assistance. I have not looked at why. But I would say it has to do with the subconscious mind that I mentioned previously. A person can only rise in consciousness if they have healed, or at least neutralized, some of those limiting beliefs and fears held subconsciously. I have found personally that there are things I can address effectively by myself and there are things that I end up needing help from someone else in order to resolve. Question: I am curious about everything having its own vibration that you have to align with. I assume that includes healthy livers, hearts, bones . . .
What you are really trying to align with is your true Self – what I call the Magnificent Self. The YOU that knows on all levels that you are perfect, healthy, happy, prosperous, etc. Question: Reiki is one way to heal with energy, but you have no idea how deficient the organ or person is. Reiki is one system of energy for bringing in Divine Healing Light. It is a great introduction to energy work, but I feel it is lacking in many ways. I often refer to it as “energetic kindergarten.” There is so much more to learn about energy and healing than a person can possibly take in during a workshop for 1 or 2 weekends with a Reiki master. What Reiki, Chi Kung, and other forms of hands-on healing are doing is bringing in enough healing energy that the person can better align with health. It is not about “adding more energy” to a particular organ as if energy were a supplement. It is about energetically raising up the body – and hopefully the mind – of the individual so that it can access the Truth about itself and let go of the false beliefs and negative energies that keep it stuck in sickness and disease. Question: Do you have any knowledge of something current or in the works to measure vibration? There was a device created that measures energy. The designer is dead and the family refuses to give out the technology. I have been unable to ascertain what really happened. One of my friends has an energy healing product line and she sends everything to europe for testing. I’ve sent her an email to see what the technology is and how to find out more about it. I’ll let you know if I find out anything more.